Management endodontischer Misser... Goldstein, Ronald E.
Chapter 02: Let's Stick Together: How Do We "Bond" Composite Resin to Tooth? Chapter 03: When Should We Place Posterior Composites? Chapter 05: Protecting Dentine and Pulp: Do We Really Need a Base? 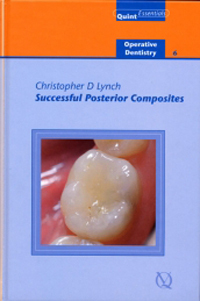 Chapter 09: The Management of Failing Direct Composite Restorations: Replace or Repair?